Nematodes are a natural form of plant protection, they are very small roundworms that can be found in almost every ecosystem on earth. Some species of these tiny creatures are predatory and can be utilised in horticulture for the control of many soilborn pests. 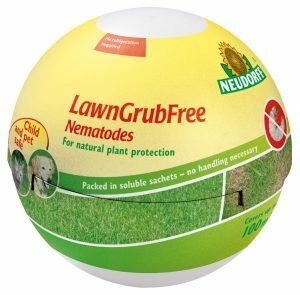 Nematodes work by killing larval pests to protect plants and lawns from damage. They begin by injecting bacteria inside the pests body, these bacteria multiply and cause blood poisoning, leading to death. Nematodes will then eat the dead body, multiply, and immediately start searching for a new host. Once their source of food is exhausted the nematodes will themselves die, leaving behind no evidence of them ever being there. 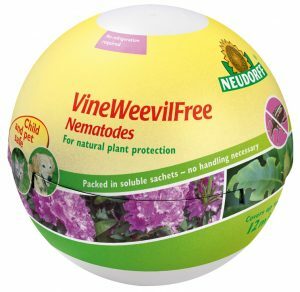 Why are Neudorff Nematodes unique? – Neudorff nematodes use new innovative technology to give them a shelf life of 6 months. – They do not need to be refrigerated due to a formulation that puts the nematodes into a state called cyptobiosis where they do not move or use oxygen. The formula maintains the correct moisture level for extended survival. – Individual soluble pouches mean they are easy to apply and there is no need to touch the nematodes during application. The pouches also mean that you can use what you require and store the remainder for upto 6 months until another application is required! 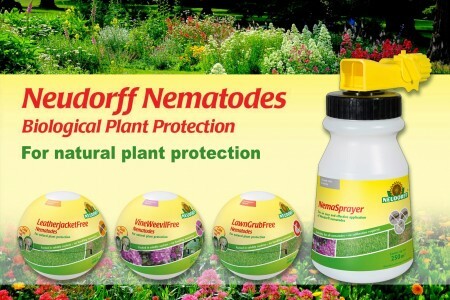 – Safe, natural and effective plant protection for beautiful plants without any damage. – Treats Black Vine Weevil Larvae. – Also treats Fungus Gnats, Cucumber Beetle, Bagworm, Gall Midge, Repels Ant Larve. – Eliminates pests right down to the roots. – Safe for children and pets. – Treated areas may be entered immediately after application. – Treats up to 12m² or 210 pots. – Safe, natural and effective plant protection for a green and healthy lawn without any damage. – Treats up to 100 m². – Treats European Crane Larvae and Ants Gnat Larvae. – Also treats Wireworm, Caterpillars, Strawberry Root Weevil, Codling Moth, Leaf Miners.